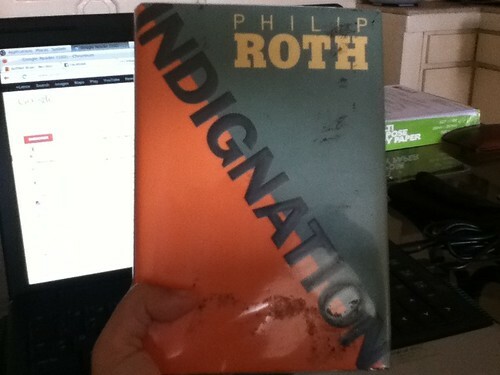 PHILIP ROTH'S INDIGNATION, a book I picked up on National Bookstore's month-long sale, is about the 19-year old Marcus Messner who decides to study elsewhere to get away from his father, a kosher butcher. He grows up helping in his father's shop, eviscerating chickens or chopping cow hides, all the while maintaining his straight A record in school. His parents are proud when he becomes the first person in the family to land in college. He wants to be a lawyer, if not a high-ranking army official to be deployed in the Korean War. Meanwhile Marcus' father becomes increasingly paranoid of his son getting killed or harmed. His father's prohibitions and warnings, many he (Marcus) considers irrational, force him to pursue his studies at Winesburg College in Ohio, hours away from his New Jersey home. There he meets Olivia Hutton with whom he experiences his first sexual encounter. Later he discovers Olivia's prominent scar on her right wrist, proof that she is, after all, a minefield of emotional and psychiatric conflicts, having attempted suicide many times and being confined at a mental hospital. Marcus, as with many Jews during the 1950's, feels isolated from the academic community. He doesn't have friends with whom he can resonate; his roommates are either too loud or too quiet for him. He is an alien in a foreign land, refusing to attend the required chapel services, avoiding invitations to fraternity dinners, and throwing away any belief in God. What used to be his anchors, his father and mother, are no longer as reliable strongholds as they once were. The love of his life, Olivia, who should have been there to cheer him on, suffers a nervous breakdown and attempts another suicide after learning she is pregnant, something Marcus believes he cannot be responsible for. Philip Roth, the master storyteller that he is, writes an ending too depressing to even describe here, something akin to failed dreams and premature death, illustrating to us (and I'm using the author's actual words) "the incomprehensible way one's most banal, incidental, even comical choices achieve the most disproportionate result." Indignation is not the most relaxing book there is, especially when one goes on 24-hour shifts every three or four days, but I've had fun reading bits and pieces of it until I reached the tragic end, which depressed me. Hi, can I ask where you bought Indignation? And what mall did you bought it?